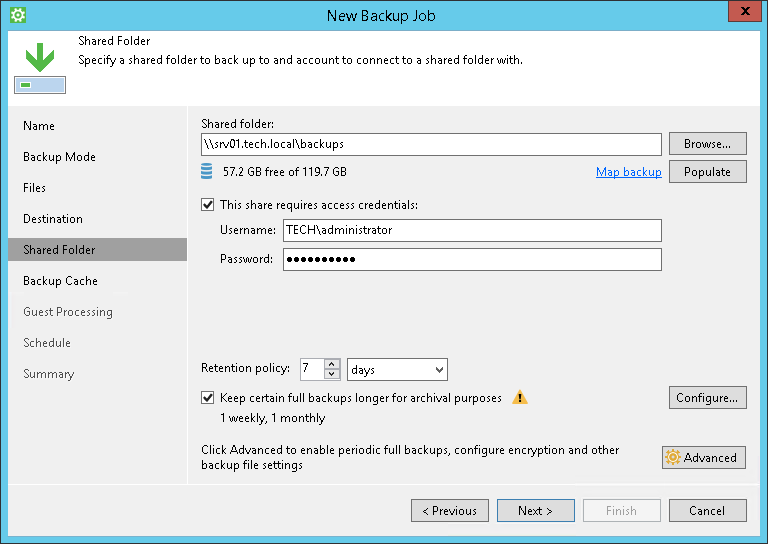 The Shared Folder step of the wizard is available if you have chosen to save the backup in a network shared folder. In the Shared folder field, type a UNC name of the network shared folder in which you want to store backup files. Keep in mind that the UNC name always starts with two back slashes (\\). To view the specified password, click and hold the eye icon on the right of the Password field. If you do not select the This share requires access credentials check box, Veeam Agent for Microsoft Windows will connect to the shared folder using the NT AUTHORITY\SYSTEM account of the computer where the product is installed. You can use this scenario if the Veeam Agent computer is joined to the Active Directory domain. In this case, you can simply grant Full Control access on the shared folder and underlying file system to the computer account (DOMAIN\COMPUTERNAME$). To view how much free space is available in the selected shared folder, click Populate.